FAV Creations is a unique flower shop that custom-designs handmade paper flowers, wedding bouquets, wedding decors, gifts and much more. 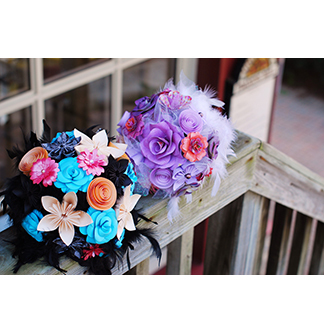 Paper flower is an excellent alternative to fresh flowers for many reasons: affordable, non-allergenic, customize options for sizes and colors, everlasting keepsakes for the bride and guests. Come and visit our website for these beautiful products. Flower 597 combines important aspects of custom and creative floral design, precision in organization and planning, sensitivity to our client’s budget concerns, flexibility to alterations and excellence in flower quality and care. Flower 597 has the utmost confidence that the flowers for your event will be unique, affordable and memorable. Foothills Florist is an independent, local, full service flower shop owned and managed by Canadian Floral Designer Sheryl Leaman. 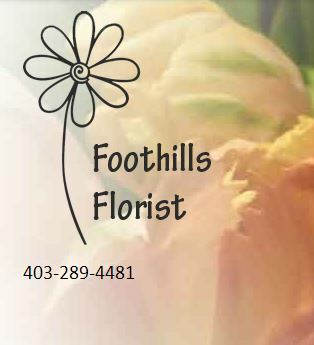 Foothills Florist has been serving our customers in Calgary at the same location for over 20 years. We are located just across the street from the Foothills Hospital Trauma Center and we are your hospital flower experts! We will provide you with the highest level of Customer Service, supply you with the freshest cut flowers and professionally design your floral arrangements and gourmet baskets. Our flowers are brought in from all corners of the world, every day of the week and we move that product so fast it doesn’t have time to lose its freshness in our coolers. Enjoy the convenience of ordering from our secure online catalog 24 hours a day, pop by the shop at 1941 Uxbridge Drive NW, (next to Cobbs bakery) or call us and speak to a designer directly at 403-289-4481. We are a budding, new company to the Floral industry and a pair of hard working, creative women. We love to share in the excitement of other people’s joy as they come together in matrimony to start their lives as one and appreciate the fact we get to become a small part of those memories. As a company we strive to listen and understand what a couple really wants their overall wedding experience to be so that we can deliver the perfect floral designs that will help bring their vision to life on their special day. We design bouquets, center pieces and much more for all sorts of wedding themes and styles and are happy to work with you to design yours uniquely! We customize everything to create unique and personalized floral designs for your event. Buy and send flowers online with ease. Flowers for any occasion: birthday, wedding, funeral, Valentine’s Day, Mother’s Day, Thanksgiving, Christmas or just because. Enjoy our same-day delivery in North America or next-day International. Satisfaction guaranteed! In Vogue Floral Design Inc.; Floral Designer for Brampton, Toronto, Mississauga and the surrounding areas. We’re all about weddings & events. We design flowers for the modern & traditional bride. In addition to our spectacular floral designs we carry Bridal jewelry & access. Visit our site. Plush Flowers commit to create lasting moments through custom design and personalized service. Our promise is to deliver fresh flowers and stunning arrangements. Regardless of the design you choose, you will get the highest quality flowers and stunning design. Don’t be hesitant to contact us if you need our help to give ideas and tips for your wedding flowers. We will be happy to assist your inquiry from a small to a large scale of events. Flowers create an interesting backdrop for any event. 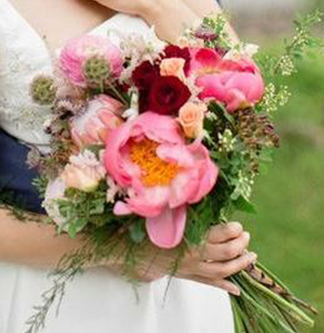 Elegant Bouquets specializes in all wedding florals. Our elegant bridal bouquets are specially crafted to reflect your personality, ensuring that each flower arrangement is unique for your special day. We take great pride in having a highly personal and consultative approach with each of our clients. We work with your style and budget to create a package that is suitable for you. Complimentary consultations are available by appointment. Call 416-356-2592 to book yours today.